Girls Generation, TVXQ, Shin Dong Yeob, and Kim Byung Man, as well as the rest of the SM family, have all stepped up to show their support for Lee Dong Woo. On the 8th, Lee Dong Woo successfully held the first performance of his play ‘Superman of My Heart’, the last installment of his ‘Superman Project’. 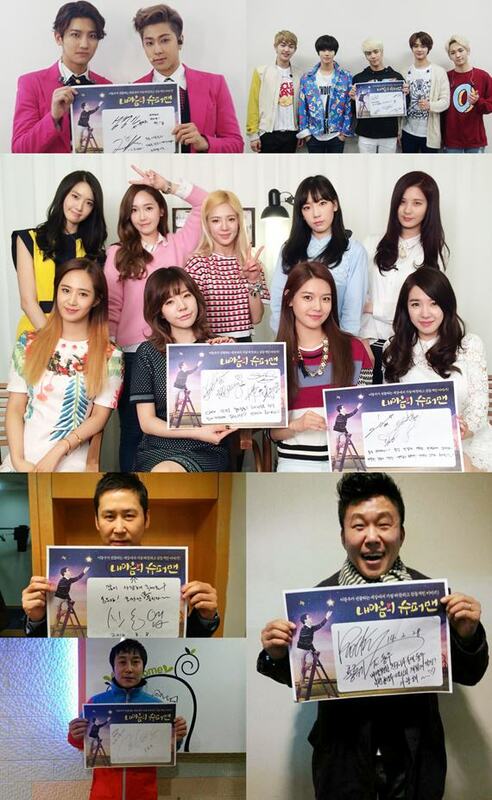 Fellow labelmates, such as Girls Generation, TVXQ, Shing Dong Yeob and Kim Byung Man, wrote messages of support for him. The released photo shows Girls Generation, TVXQ, SHINee, Shin Dong Yeob, Kim Byung Man and Hong Rok Ki smiling and holding messages of support for ‘Superman of My Heart’. Girls Generation, Super Junior, SHINee and Lee Yeon Hee also left messages of support in a video through SM Entertainment’s official YouTube channel, expressing their excitement for the new play. The play depicts the story of a famous actor who loses his eyesight in a car accident, having to set aside his dreams and go back to his hometown to set up a supermarket. There, his 10-year-old daughter, who he didn’t know existed, appears in front of his eyes. Lee Dong Woo plays the role of Sung Goo as he transforms from a man with no dreams to a true father. ‘Superman of My Heart’ will be held from now till the 6th of April.